Whether it's searching the flats for a Bahaman bonefish, hunting trophy trout in New Zealand or doing battle with mighty Atlantic salmon in Norway or Russia that gets your heart racing, our bumper fly fishing guide will take you there. 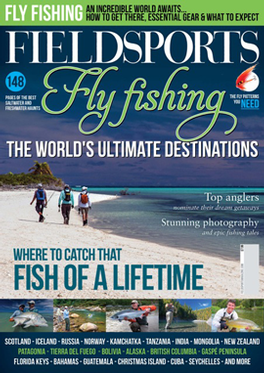 Featuring 22 of the world's finest fresh and saltwater destinations and with indispensable fishing tips, travel advice, tackle recommendations and stunning photography, this special 148-page edition of Fieldsports is not to be missed. Boasting outstanding photography and copy from the likes of Matt Harris, Henry Gilbey, Tarquin Millington-Drake, Gerhard Laubscher, Paul Procter, David Profumo, Orri Vigfusson and Brian O'Keefe, the quality of production will be of the highest standards. Be the first person to tell us what you think about Fieldsports: The World&apos;s Ultimate Fly Fishing Destinations and you'll save £2.50 on your next purchase!